Writing a “Treehouse Of Horror” segment has to be both exhilarating and daunting. It’s exhilarating because it affords writers all the freedom in the world […] And it’s daunting because each segment has to tell a full, complete story in something like six minutes while doing justice to revered source material and including the non-stop laughs and genius gags that characterized The Simpsons in its god-like prime. As the show has gone on (an astounding if you think about it 22 more years since “Treehouse Of Horror III”), we’ve seen some of that old “Treehouse” spirit seep into the show proper, usually to the series’ detriment. The Simpsons has a, let’s call it, elastic reality, but that reality’s rules can only be stretched, not punctured. So Homer can go to space as part of a NASA program, but he really shouldn’t be whisked off to another planet by two alien characters who’d been established as purely fictional in the “Treehouse” setting. (And characters from another sci-fi series shouldn’t visit, leaving the inert body of one of their number in the Simpsons’ basement, that sort of thing.) In last week’s truly outstanding, pre-”Treehouse” Halloween episode, Homer gives voice to some of the storytelling fatigue seemingly settled like a fog on the present-day writers’ room, exhaustedly telling Flanders the uninspired plots of the family’s annual Halloween storytelling night (a Psycho thing with Skinner and his mother, evil furniture, etc. ), before contemptuously ending, “eh, people seem to like it.” The Simpsons has a long history of making reference to its own failings (or viewers’ complaints about supposed failings), but making a joke about tired storytelling doesn’t remove the sting if the storytelling is, indeed, sort of tired. “Treehouse Of Horror XXVI” doesn’t have the furniture come to life, but it’s not much more inspired than Homer’s offhand rundown suggests, either. In a great “Treehouse” segment, it seems like the show is fairly bursting with great ideas that just couldn’t possibly fit into the regular continuity. In a middling one, the horror (or, in this case, horror, sci-fi and kaiju) parody hits the expected beats and calls it a day. Or, as in the case of the first segment, “Wanted Dead Then Alive,” just goes for the gore. In an amusingly pointed press release sent out by the show, Sideshow Bob (in addition to threatening, well, me) said he was finally going to kill one Bart Simpson, and, tonight, he sure does, first impaling his taunting nemesis through the heart with a spear gun, then turning the lad’s increasingly decrepit corpse into a backpack, a golf trainer, and unfortunately flatulent all-purpose decoration before getting the bright idea to bring Bart back to life (via leprechaun-powered science) so he can murder him to his heart’s content. 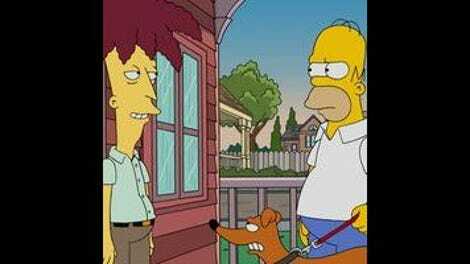 Kelsey Grammer’s always welcome as Bob, tonight luring Bart to Springfield Elementary’s music room with a faux Milhouse text about Mr. Largo being caught in a harp (“looks funny, sounds exquisite” should have been a giveaway). As Bob delightedly croons, it’s like Elmer Fudd finally catching Bugs, but, as he soon discovers along with the audience, it’s a lot less fun to watch Elmer brutally eviscerate his prey than it is to watch him get elaborately thwarted. There may be some catharsis for the writers as well as Springfield’s favorite Gilbert and Sullivan-singing would-be murderer, as Bart is really put through the wringer here (his “Ay, carumba!” while being brutally bludgeoned to death by Bob’s sledgehammer suggests someone is exorcising some Bart hate along with Bob), but the gore so explicit (intestines are a major theme) that there’s not much glee in the dark humor. (Homer’s lamp-bashing revenge continues the trend, finally severing Bob’s head, but only after a series of deep, gashing cuts.) There are a few clever touches to Bob’s Emperor Joker-style endless Bart murders (that’s good comic timing on the unexpected lion attack), but, in the end, “Wanted Dead Then Alive” is as repetitive as murdering your arch-enemy again and again and again. 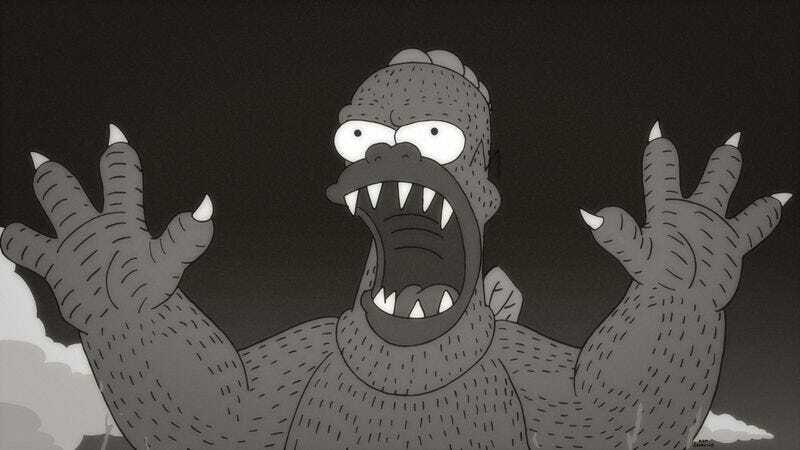 Speaking of “Treehouse Of Horror III,” “Homerzilla” recalls “King Homer,” except that, here, Homer is Godzilla instead of King Kong, and, here, the setup is used for some awfully tired Japanese monster movie jokes (did you know those original Godzilla movies were often poorly dubbed? ), and a year-late parody of the most recent American remake. Since we’re in Japan, the segment also ticks off every obvious Japanese culture joke in sight (sushi, Mr. Sparkle), although Agnes Skinner swooping through the background as Yubaba from Spirited Away (and destroying box kite Seymour) is at least specifically obscure, and the idea that the kids’ dead grandfather had become the spirit of Marge’s teapot is funny. (When Grandpa dies and he’s faced with an eternity of listening to the old man, the samurai ghost kills himself and ascends to yet another ghost plane entirely.) Also, apart from Grandpa “Simp-san” being consistently boring to listen to, there’s not much use made of the Simpson characters—Japanese Lisa attempts to talk some sense into the rampaging Homerzilla (“This land is 98% rural. There’s so much farmland you can walk on without hurting your feet!”), but the whole setup is mostly an excuse to bash Gareth Edwards’ perhaps-unnecessary but certainly not an embarrassment 2014 remake, with Homerzilla redesigned to be chunkier (and more product placement-friendly), and the whole thing written off as the massive commercial and artistic failure the actual film wasn’t. There are some decent jokes—Dan Castellaneta does a funny riff of Bryan Cranston’s overwrought ranting (“All we can do is avoid him easily!”), and, inaccurate or not, an exec’s assertion, “We’ll make millions after spending hundreds of millions!” is a good line at the expense of Hollywood waste, but, unlike American Homerzilla, there’s not too much meat on this Godzilla’s bones. It’s Chronicle’s turn in the treehouse for “Telepaths Of Glory,” with Bart, Milhouse, and Lisa getting telekinetic powers from some Springfield Nuclear glowing green goop and using their mind-brains to reshape the world. Well, Milhouse and Lisa anyway—Bart is left powerless, rejecting Milhouse’s help with a peevish, “Do not make me pity-fly.” As with its fellows tonight, there’s not much inventiveness to the comedy that ensues—there’s the requisite, grumpy found-footage burn (“The important thing these days is everything has to be on film”), and, naturally, Milhouse goes mad with power, creating Milhouse moai on the Simpsons’ lawn, dropping wedgie-giving Dolph into an active volcano (“This is not a proportional punishment!”), and bringing his parents back together in the form of a Cronenberg-ian flesh-meld (“I still don’t feel close to you,” gripes the Luann half). When it turns out Maggie, radioactive rod in place of her pacifier, has even greater powers, she sets things aright in ways both adorably character-specific (playing rings with the KBBL radio tower, Lard Lad giant donut, ‘D’ from the Springfield sign, and a burning tire, and turning Homerzilla into Barney), and middle-aged writers’ room lazy (putting a shirt on horseback-riding Vladimir Putin, making a Frenchman polite). As with the others, there are enough clever touches to carry things along—after Lisa telekinetically corrects Bart’s anti-Skinner graffiti, Seymour dutifully turns her “winner” back to “wiener,” the found-footage gimmick (mostly ignored) sees the world’s physics being warped by the fish-eye perspective at one point. A “Treehouse Of Horror” is a place for Simpsons writers to cut loose with their imaginations and play. “Treehouse Of Horror XXVI” is a pleasant enough goof, but for truly memorable Simpsons Halloween fun, I suggest going back a week. The couch gag, by Ren & Stimpy creator John Kricfalusi continues the trend of bringing in celebrated animators to transform the Simpsons template into their own, often grotesque visions. Kricfalusi’s your guy if you want grotesque, and his gory Halloween tale sees the reanimated, demonic, rotted-toothed Frank Grimes peeling Bart like a banana and yanking Homer’s ghost right out of his body. The Grinch-esque song sneaks in Kricfalusi’s signature scatology while being quite catchy, and the creator’s gross-out, irreverent world view permeates the proceedings like the ever-present stink lines emanating from seemingly every pore. Call me sadistic, but Frink getting squashed mid-explanation is always gonna be funny.